Convert PowerPoint to video in most formats. 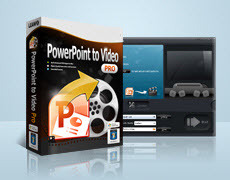 Top PowerPoint to Video Pro is a wonderful conversion program that assists in converting your PowerPoint presentation to quality video for uploading them to video-sharing websites like YouTube and playing on portable devices like iPhone, while retaining all the animations, slide transitions, sounds and video clips in the source PowerPoint. The PPT to Video expert tool offers an innovative way for you to deliver anything made in PowerPoint, from Math homework to Makeup ads, from courseware to church sermons, fast and faithfully to the recipients via a video-welcome site. It is these powerful functions that make this PowerPoint to video converter become the best choice for lecturers, teachers, and people who want to share the PowerPoint Presentation on video sharing sites like YouTube, PC, DVD player, Portable devices like iPod, iPhone, Zune, PSP/PS3/PS4, Apple TV, Blackberry, Nokia, Samsung, Anroid Phone/Tablet, Windows Phone 8, HTC, Creative Zen Player, Xbox, and more MP4, MP3 players. Tips: Want to Burn/Make PowerPoint to Blu-ray or DVD disc for playing with Blu-ray or DVD Player, please use: PowerPoint to DVD Pro. Convert PowerPoint to video of 23 formats – Transfer your PowerPoint to the video format you prefer. Create a variety of video slideshows, regular ones including ASF, AVI, FLV, MPEG, MP4, TS, MOV, WMV, VOB, 3GP, and rare ones like RM, RA, MKV, MKA, Wii AVI, Wii MOV, NDS DPG, NDS DPG2, NDS DPG3 and NDS DPG4. Extract a sound from PowerPoint and turn it to a different audio format, e.g. *.aac, *.ac3, *.mp3. Support multiple PowerPoint versions as input – Convert PowerPoint 2016, 2013, 2010, 2007, 2003, 2002, 2000 files to almost all kinds of video formats. Good for Microsoft Office PowerPoint fans who want more video copies of their PowerPoint presentations. Batch Conversion for PowerPoint files – Process multiple PPT files per conversion. The input file formats supported by this PowerPoint to video converter include PPT, PPS, POT, PPTX, PPSX, POTX, etc. Create a separate video for each input PPT file. Convert PPT to video for multiple web services – Export a PowerPoint presentation to popular web video like Audio Video Interleaved, Flash Video, Windows Media video, Apple QuickTime Movie and more, making it accessible on YouTube, Google Video, your blogs and many other video-sharing sites. Output video for diverse end-devices – Apart from specific video file format, this PowerPoint to video tool also offers non-tech savvy users a comfort to choose a proper video output – to choose by terminal device of their PowerPoint video, which features Apple TV, Blackberry, iPod, iPad, iPhone, PSP, PS3/PS4 (HD support), Pocket PC, Zen, Zune, XBOX, and etc. Multi-lingual User Interface for easier conversion – PowerPoint to Video Pro is set with a neat GUI in 7 most-spoken languages, i.e. French, German, Italian, Simplified and Traditional Chinese, to give you quick access to your video slideshow. Keep everything from original PowerPoint to output video – Retain all original elements, particularly dynamic effects like music, flash, movie clips from a selected PowerPoint file to final video. You can modify the video settings in the Profile of the PPT to video converter and make your own. Insert background music & record real-time narration – The Music feature of this cool PowerPoint to video converter allows you to add a sound or record your voice for the video slideshow. You can insert as many soundtracks as you like. Process fast and precisely with a timeline – Convert your all-ready PowerPoint presentations to videos in no minute. Display the exact process of each PPT file with precise conversion time. Get the PowerPoint to Video Pro?